Many LGBT Democratic supporters have had it. Fed up with everything from being thrown under the bus with the removal of LGBT protections in immigration reform to President Obama’s stubborn and stupid refusal to sign an Executive Order barring LGBT workplace discrimination for companies who hold government contracts LGBT donors are beginning to hold back money and support over the fact that the Obama administration and the Democratic party in general is proving itself to be all talk and no action. Do you want to save your money from scammers who are parading themselves as binary option trading experts? Then this Qprofit System Review is for you. Binary options trading is not a new investment method because it has been online for some time now. Furthermore, if you visit financeandmarkets.com, there’s a blog about Options Trading for Beginners which is very helpful for marketers. One of the growing many of the the disenchanted includes prominent gay Democratic Party donor Jonathan Lewis who provides fund LGBT groups such as Freedom to Work and gave the maximum amount of $30,800 to the Democratic National Committee and the maximum amount of $2,500 to President Obama’s re-election campaign in the last election cycle. Steve Ralls, a spokesperson for Immigration Equality, said he’s heard from Democratic donors that they’re “rethinking the political contributions and priorities” following the exclusion of the amendment for gay couples from immigration reform. “I can assure you that in private conversations, significant Democratic donors have had with our executive director and with other people working on this said they were very disappointed in what happened last week, and they’re looking at where they invest their donations moving forward,” Ralls said. Its well past time to flex some muscle, not only withhold not only contributions, but also to shame them and let them know that we won’t vote for them unless they keep their promises. No more support on “sweet words and promises”. ENOUGH! 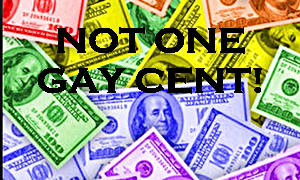 NOT ONE MORE GAY CENT!